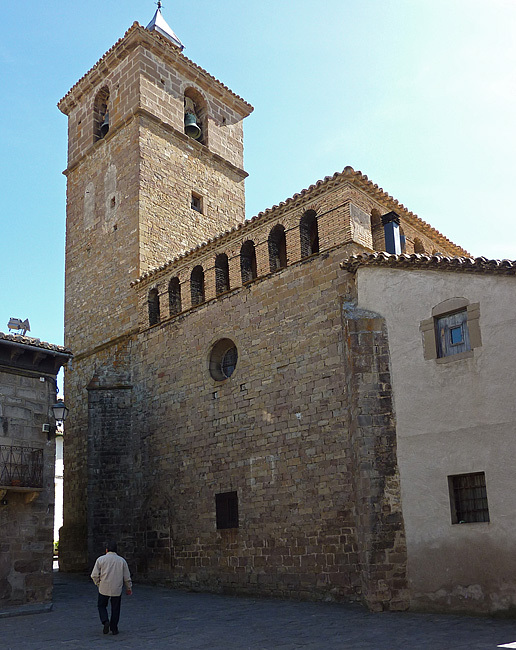 Situated at the top of the medieval town the parish church of the 16th and 17th centuries is thought to have been built on the site of an earlier Romanesque church. 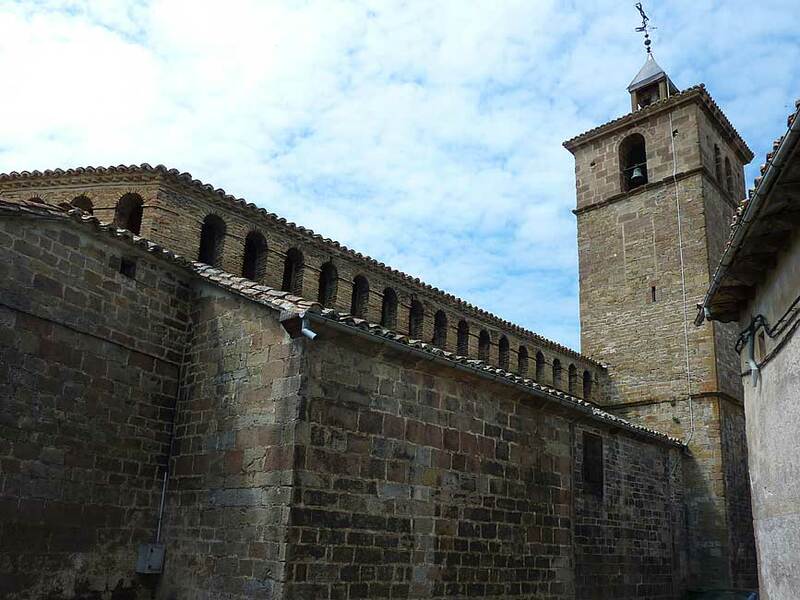 It is mainly constructed of rough hewn stone and ashlar (larger, finely worked stone) and with a top gallery of brick over the nave. The first version of the church was completed in 1519 in the Gothic style of the period and consisted of the central nave with a three-sided polygonal east end plus the lower two stages of the bell tower on the north-west. 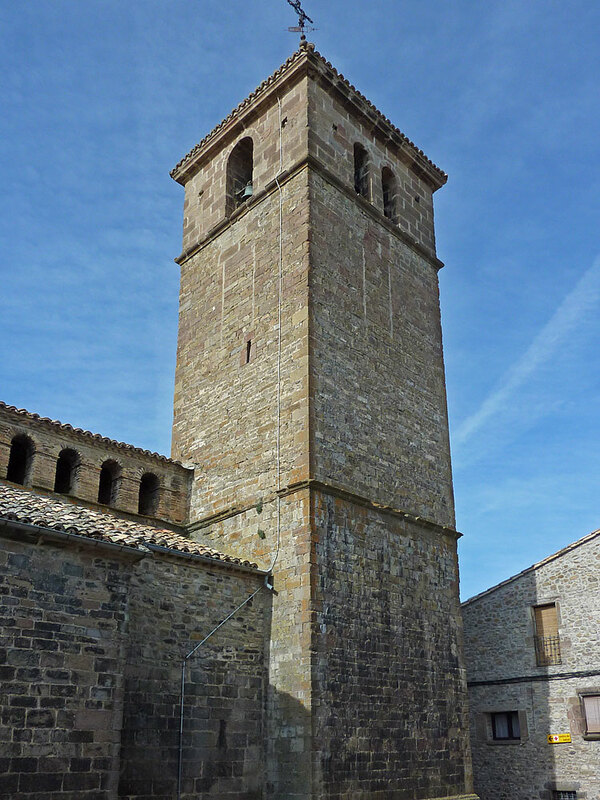 In 1552 a third stage in ashlar was added to the tower. 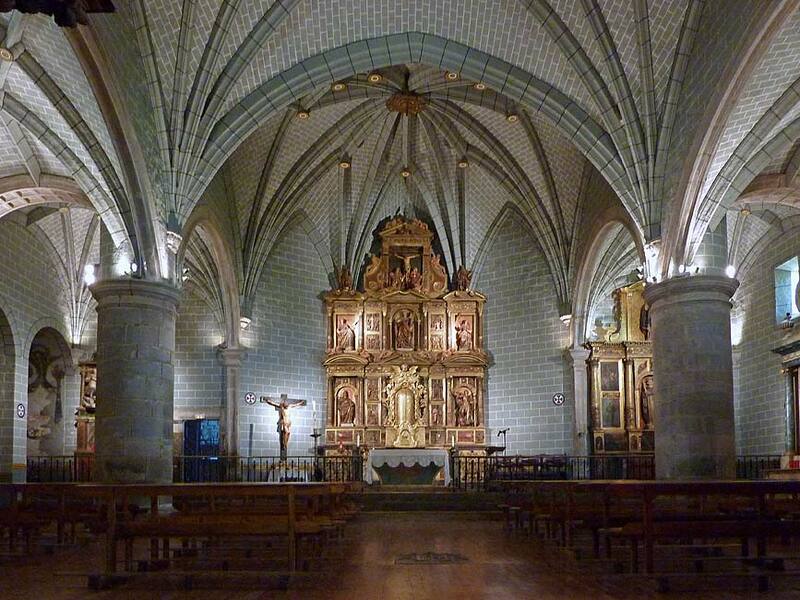 In 1612-19 the south and north aisle were added, together with the open round-arched gallery of brick over the nave. A vestry was added at the north-east end (not visible). 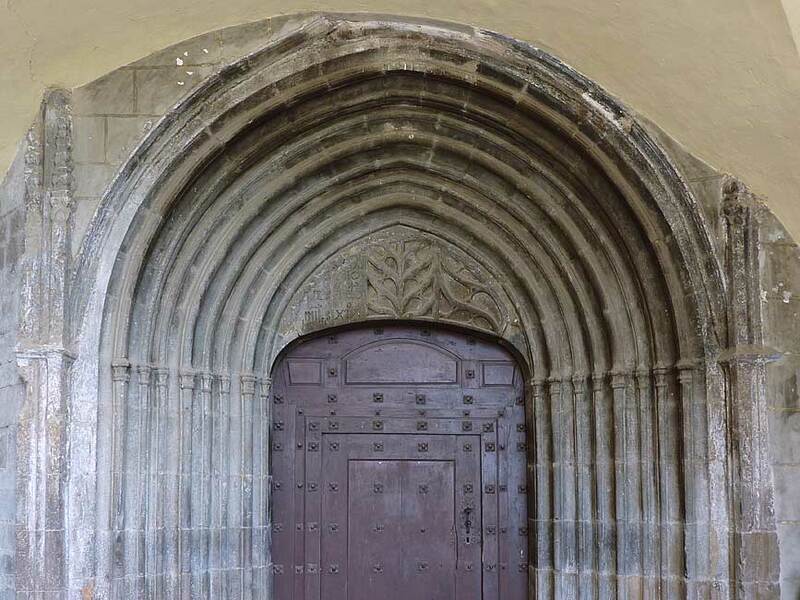 The entrance to the church is of the original construction completed 1519 and has this date and the builder Miguel de Betania inscribed in the tympanum. 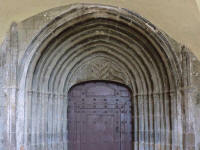 A Gothic pointed arch with many parallel mouldings supported on thin columns with capitals and pinnacled columns on the outside. 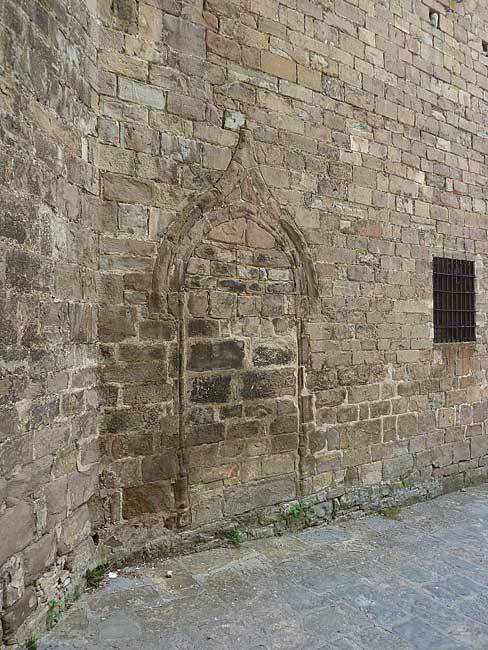 A doorway at the west end with the ogee arch was blocked up in 1571, the so-called doorway of the Agotes who were outcasts of the Pyrenees region at the time, also known as Cagots. They had to have a separate entrance and were restricted to a separate part of the church. 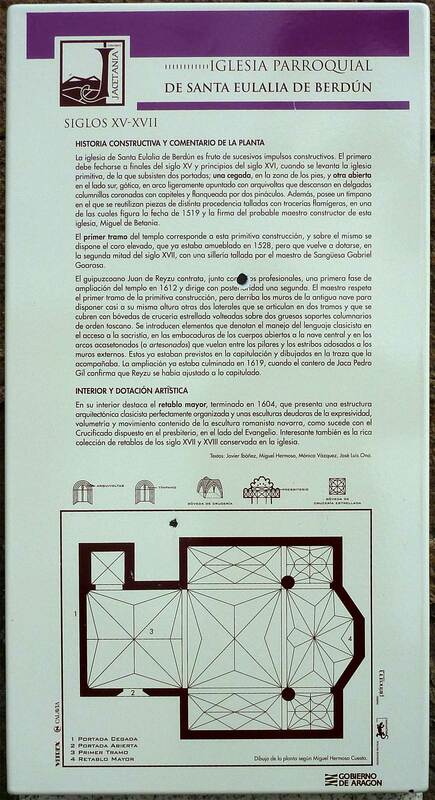 On the wall of the church a plan and description in Spanish. 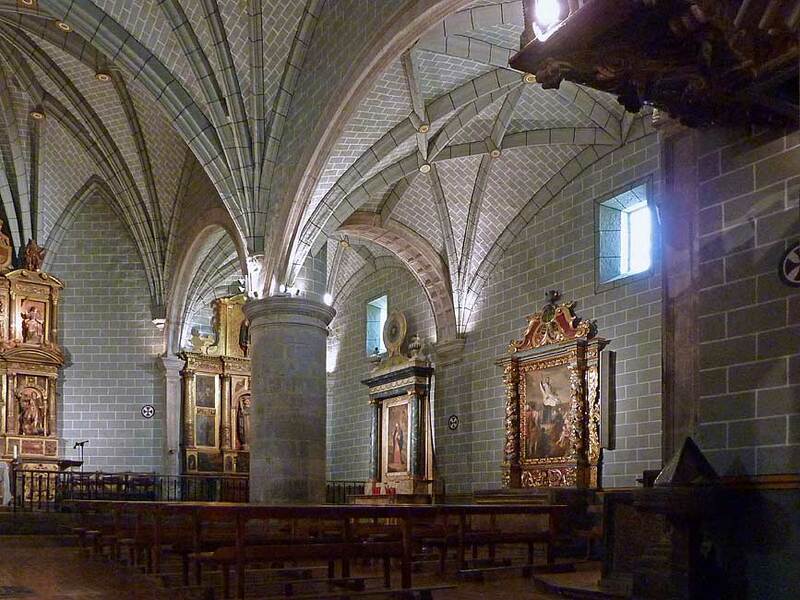 Originally there was just the Gothic nave (pointed arches) in three bays with solid external walls, completed 1519. 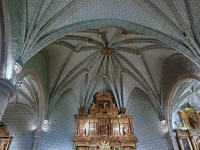 The interior walls are painted plaster to resemble ashlar masonry. 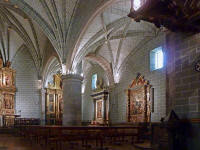 Then in 1612-19 the walls were replaced in the two east bays by open arcades to new aisles on the north and south. 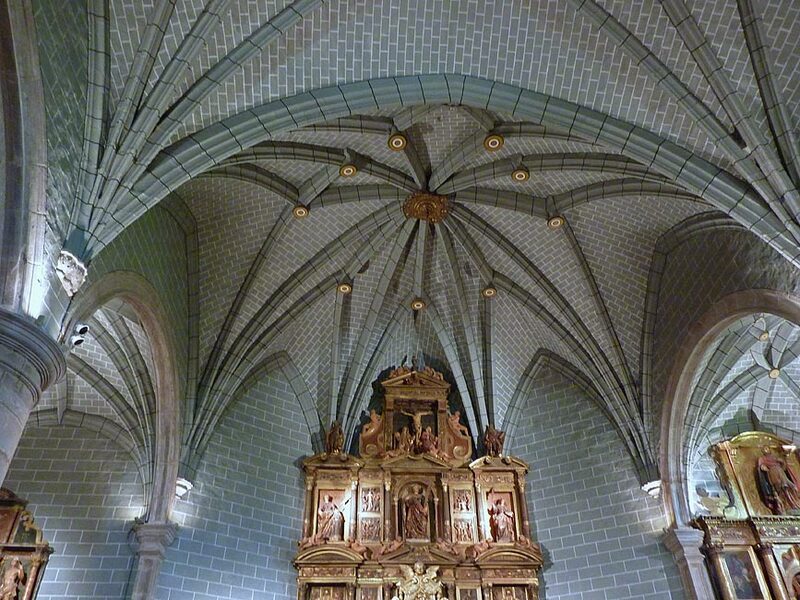 Now round-headed arches in the Baroque classical fashion. 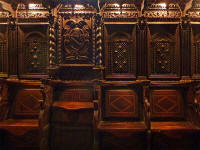 The vaults have bosses on the rib crossings. 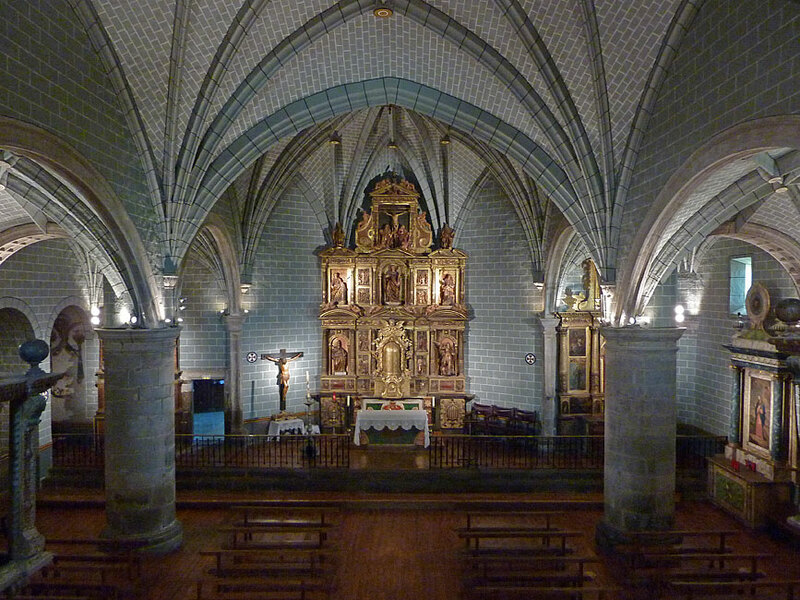 The new aisles did not extend to the third, west bay of the nave. 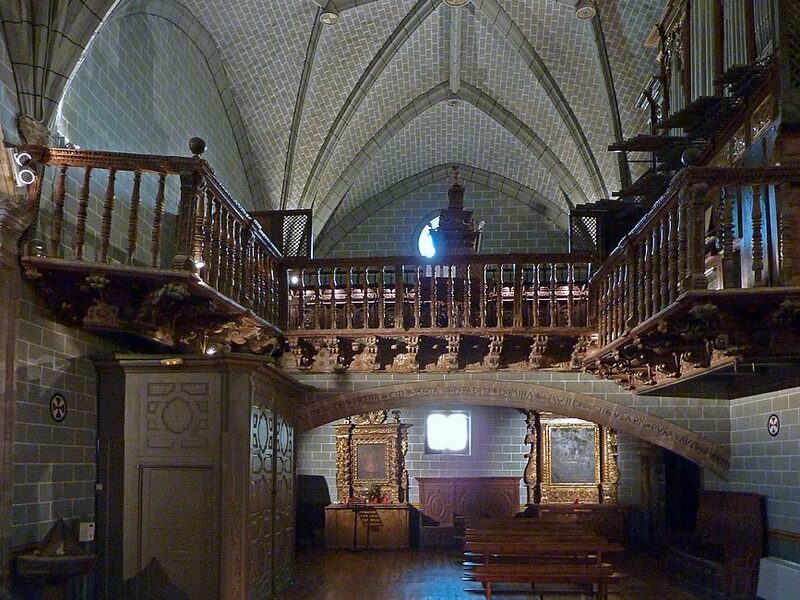 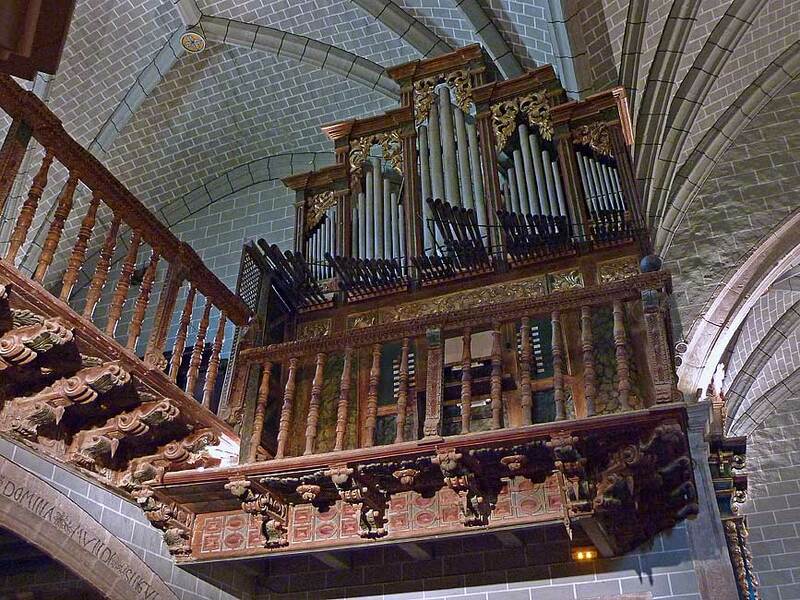 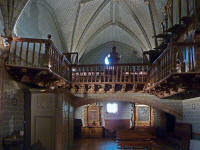 Here is the choir gallery with balustrade of 1665. 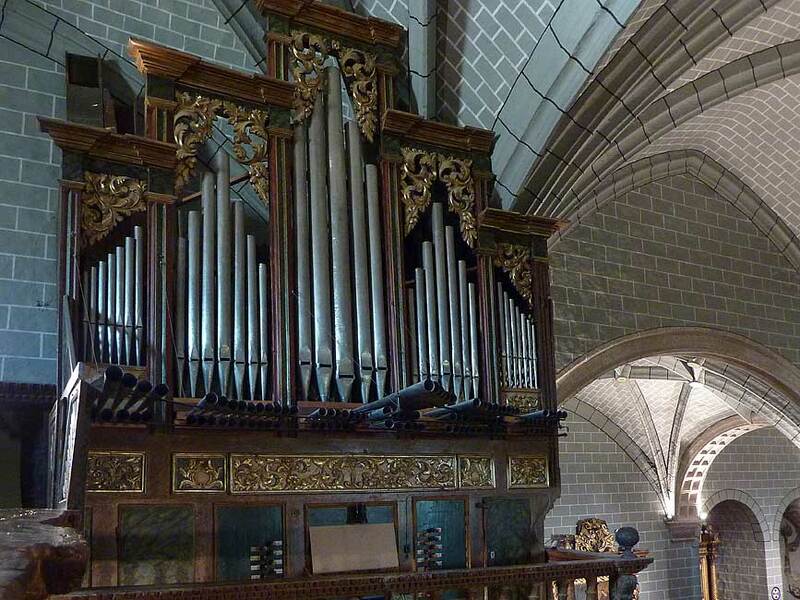 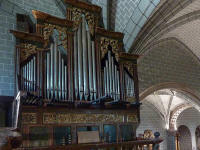 The organ dates from 1628 but has been renovated several times over the centuries. 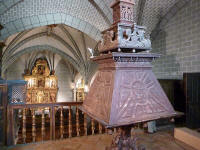 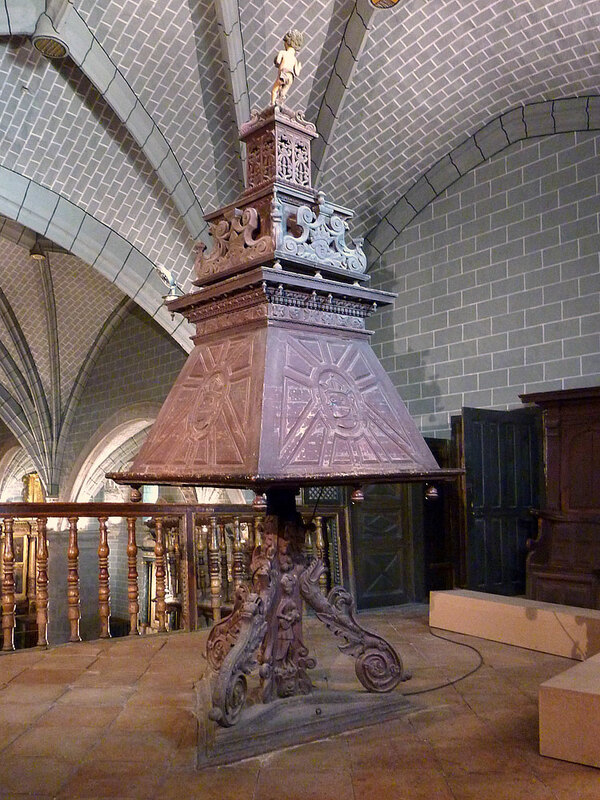 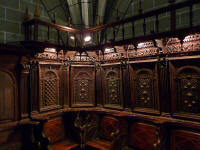 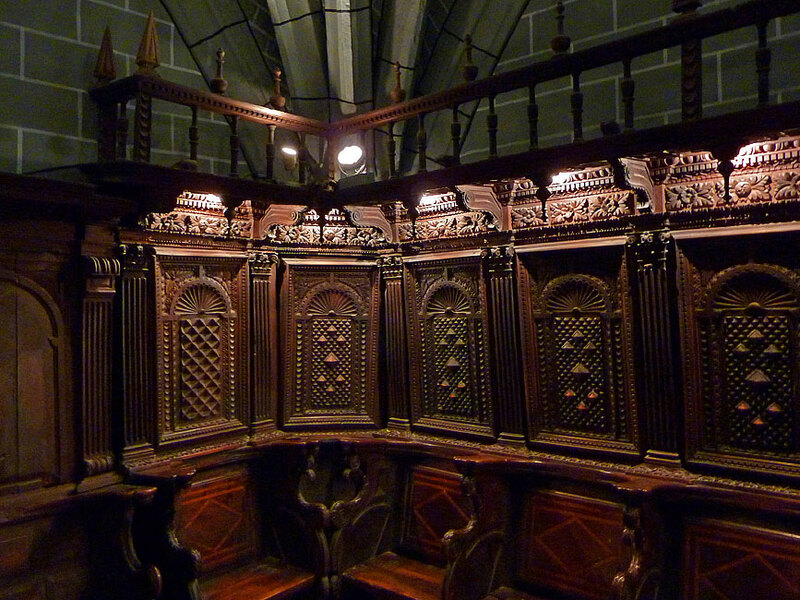 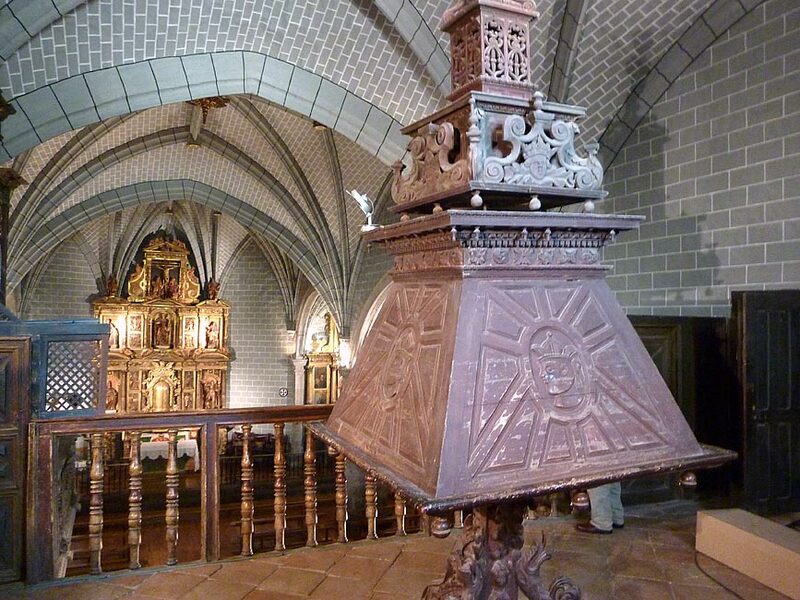 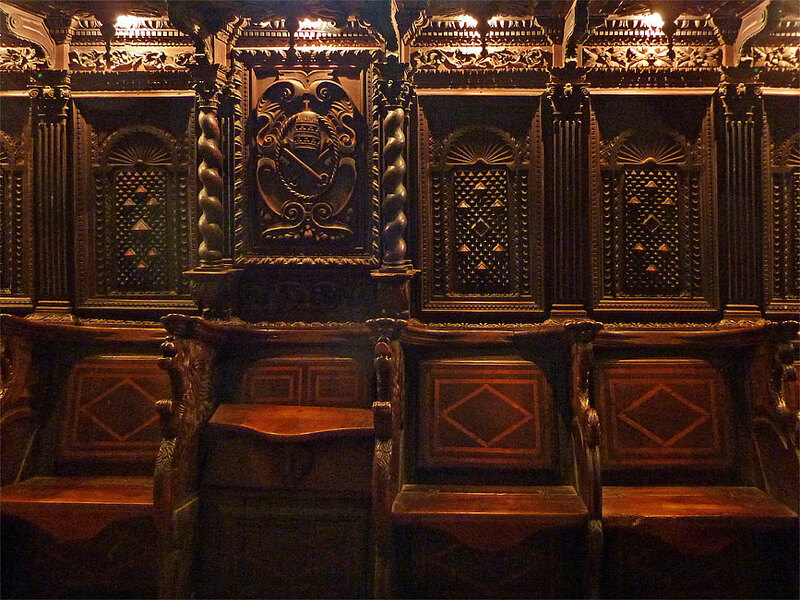 The lectern and the Baroque stalls in the choir gallery date from 1667. 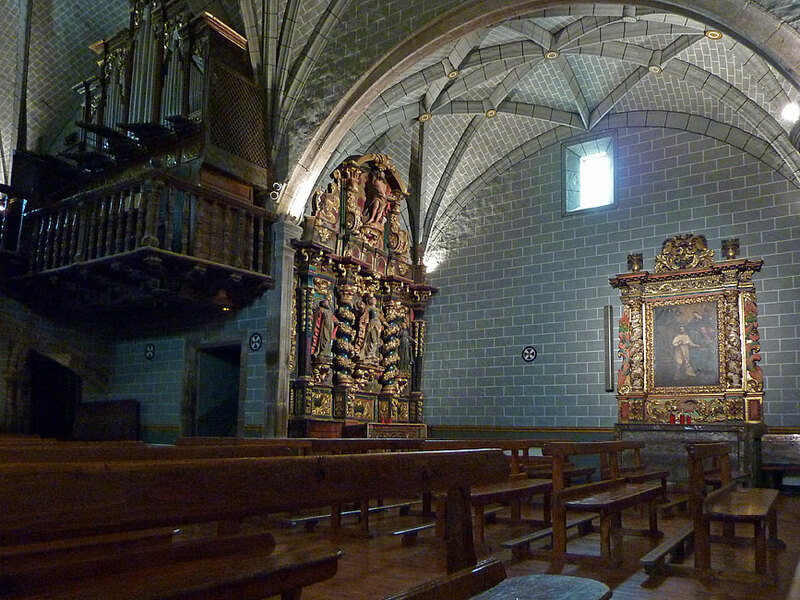 There are many altarpieces in the church, only some shown here. 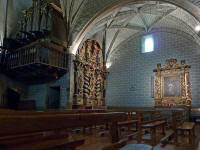 First two pictures show the central altarpiece at the east end of the nave from the last quarter of the 16th century. 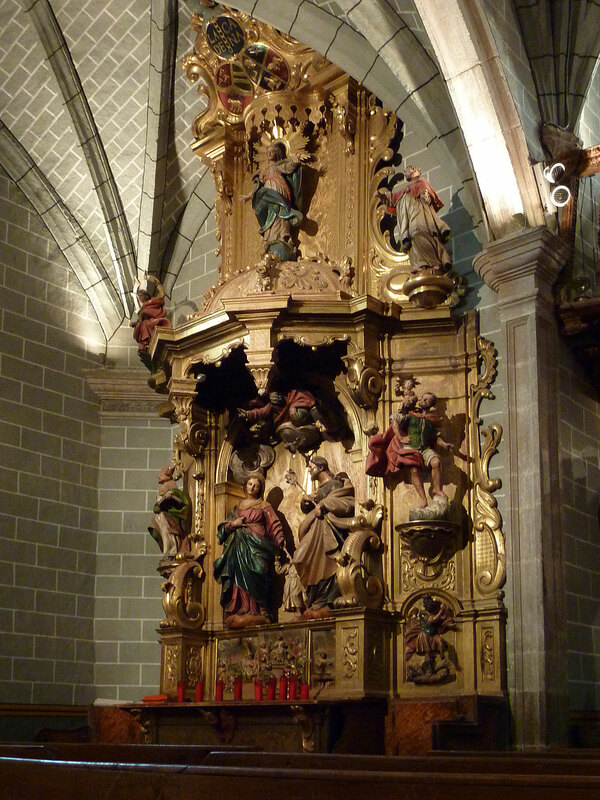 It depicts many saints and scenes from their lives. 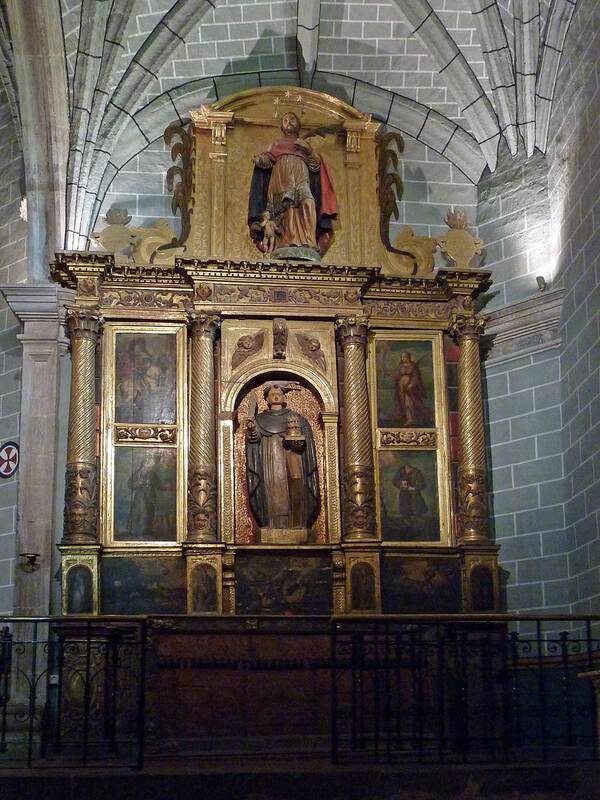 Santa Eulalia is in the middle of the upper row with four scenes from her life. 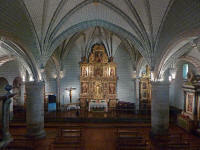 The third picture is from the east wall of the north aisle depicting Our Lady of the Rosary. 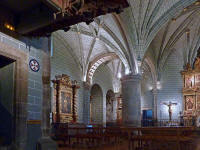 The last picture is from the east wall of the south aisle depicting St Peter the Martyr and other saints. 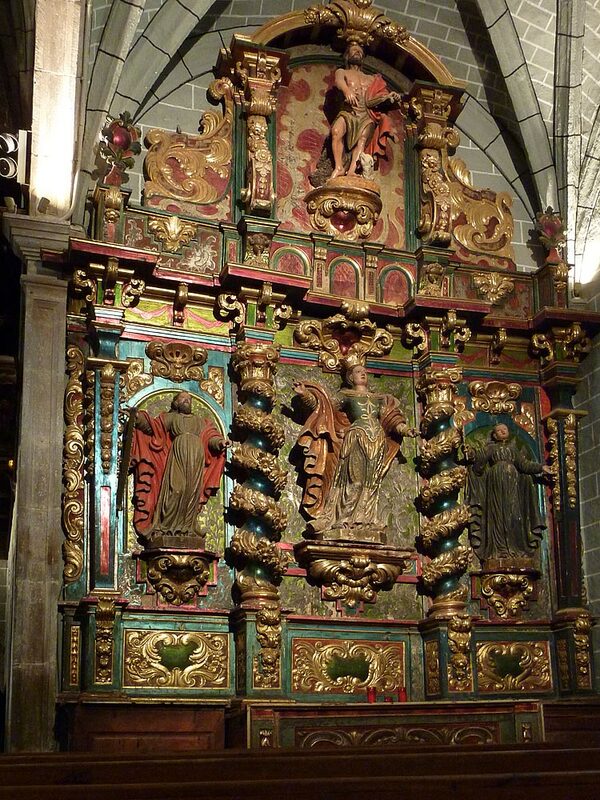 First two pictures show the Baroque altarpiece of the 18th century at the west end of the north aisle. 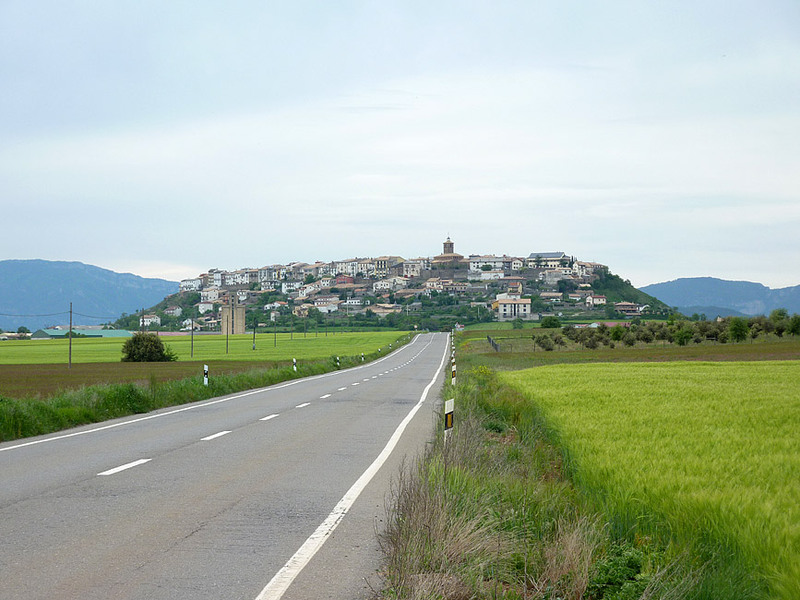 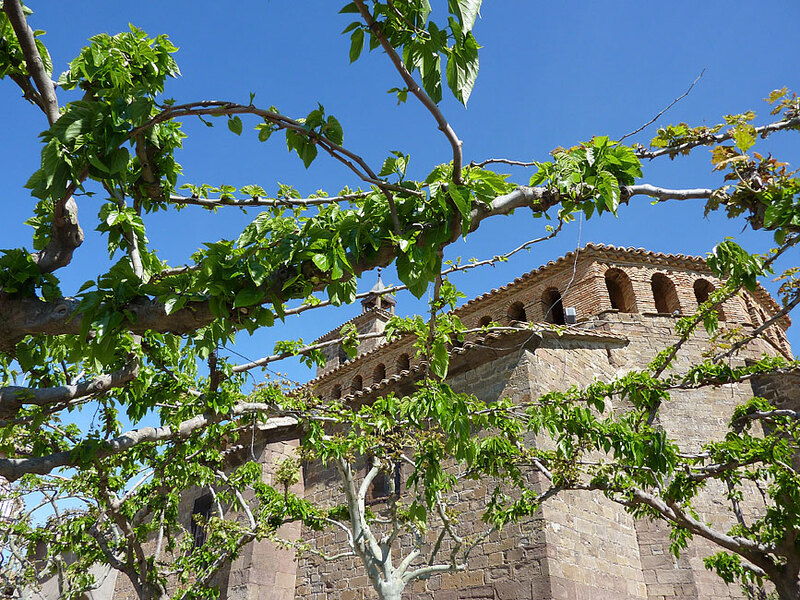 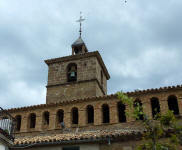 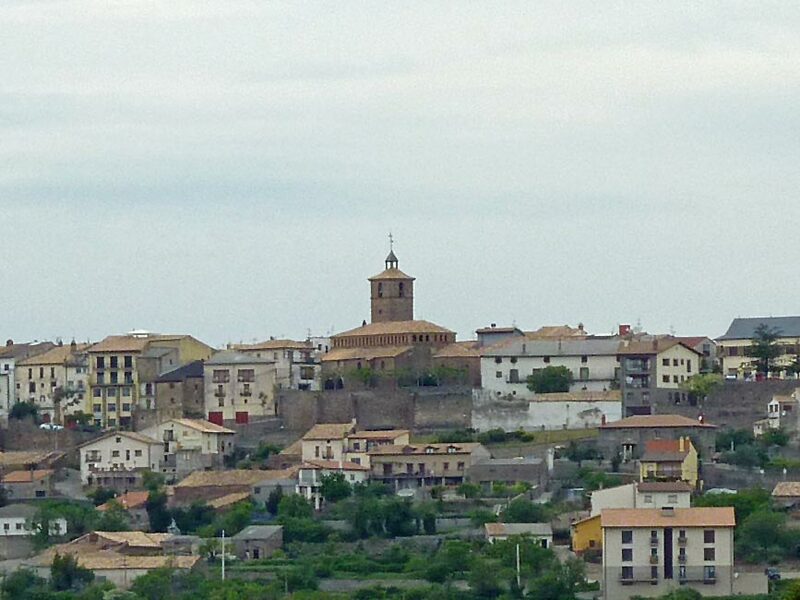 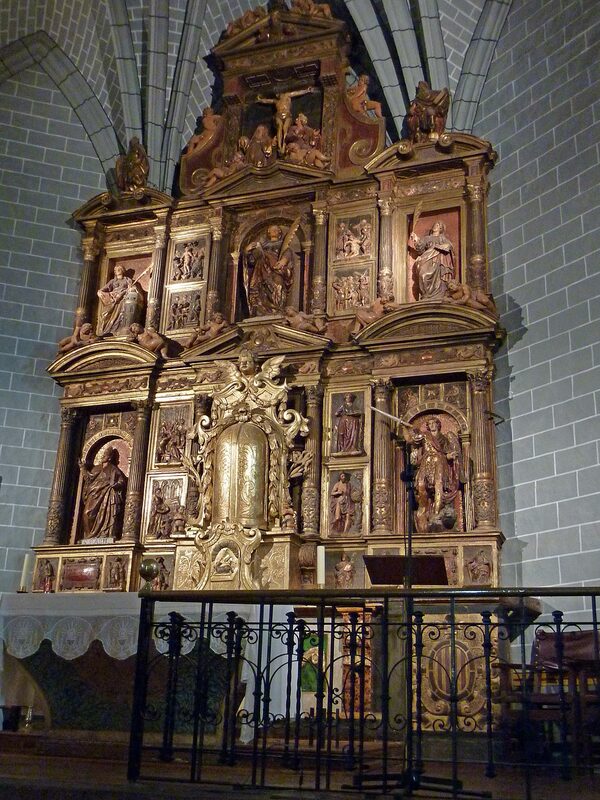 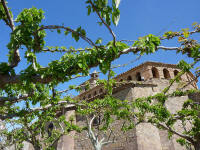 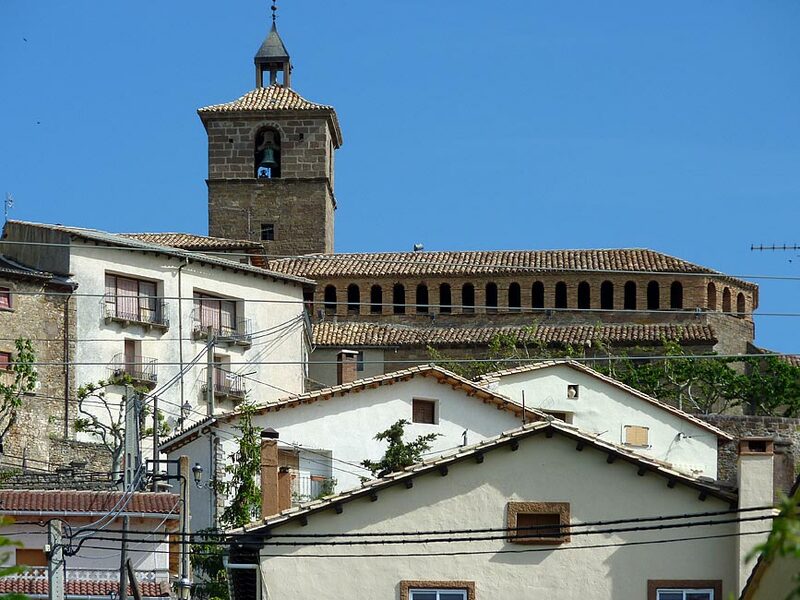 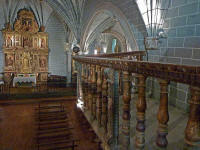 This depicts in the centre Saint Orosia (or Eurosia), patron saint of Jaca, the nearby cathedral town. 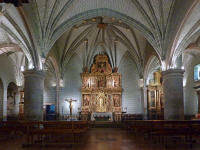 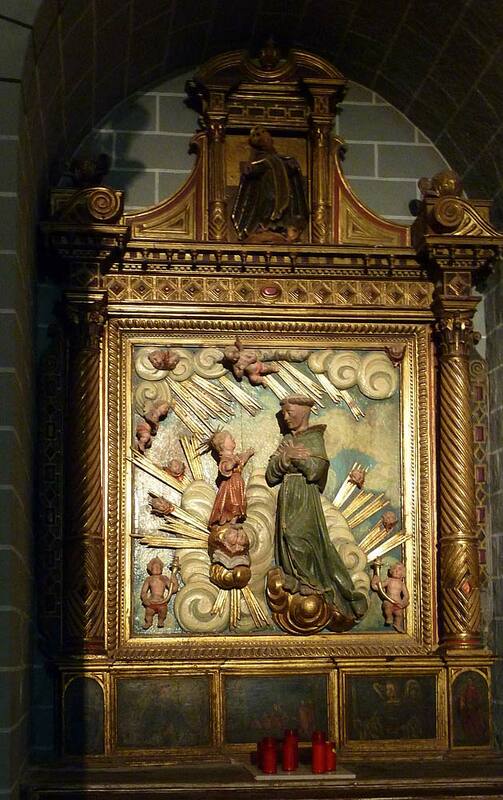 The third picture is the altarpiece in the north aisle to Saint Anthony of Padua. 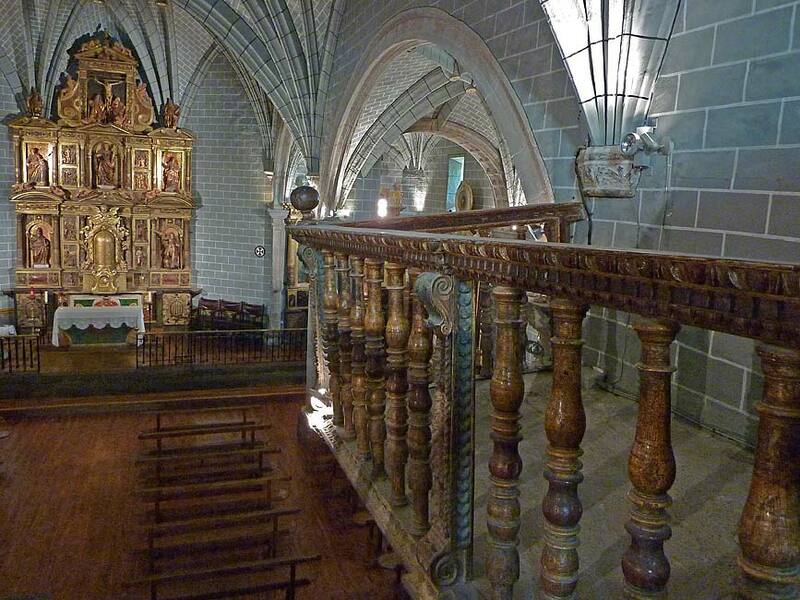 This dates from1649 and was restored in 1883. 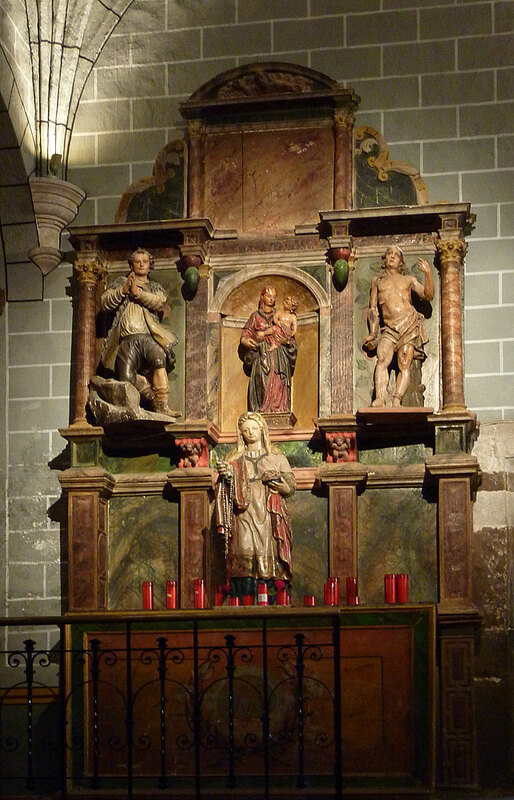 The last picture shows the sculptural altarpiece in the west wall of the south aisle depicting the Holy Family. 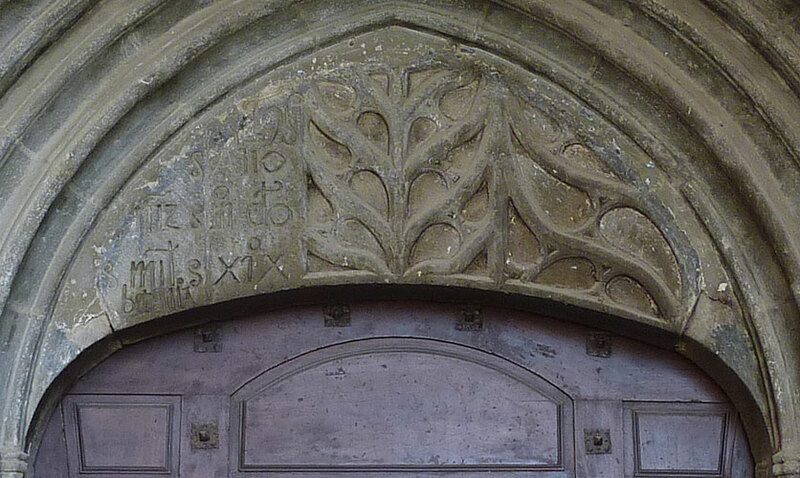 This dates from the 1780s.